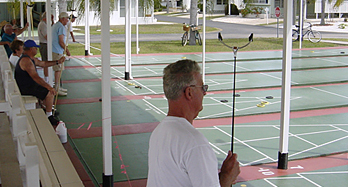 South Winds Mobile Home Park is a fully developed mobile home park for seniors 55 and up, located in the greater Sarasota, Florida area just north of Stickney Point Road and Route 41 on the Tamiami Trail. Siesta Key Beach, Phillippi Estate Park, two shopping centers, and many restaurants are within 2 miles and, with traffic light access from South Winds to Route 41, getting there is pretty easy, whether you choose to walk or ride. South Winds is a member-owned, financially stable park offering a sustainable and affordable lifestyle. South Winds residents enjoy up-to-date community facilities, many recreational and social activities for the active adult, and find great pleasure in just relaxing during their senior years in our Florida climate. Thank you for your visit to our web site. As you browse around, we hope you’ll get a sense of our friendly and caring community. Whether you’re sedately retiring, mildly active or always on the go, South Winds can accommodate your life style. Reading, sitting by the pool, checking the e-mail on the WiFi, playing Bingo or cards, might be a full day for some. Others, of the ‘catch me if you can’ persuasion, join exercise classes, bowl, play competitive shuffleboard, swim and will chair a committee, without blinking an eye.